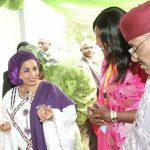 Dr Lalla Malika Issoufou, First Lady of Niger, was named as Smart Food Ambassador for her vision and leadership in nutrition and the promotion of traditional food crops such as millet. 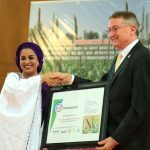 Dr Peter Carberry, Director General, ICRISAT, presented the plaque of recognition during the launch of the International Millet Festival (FESTIMIL) in Niamey, Niger, on 21 February. The Smart Food initiative is all about food that is ‘Smart’- good for you (healthy), good for the planet (sustainable) and good for the farmer. The vision of Smart Food initiative is to diversify staples by bringing Smart Foods like millets back as a major part of diets across Africa and Asia. 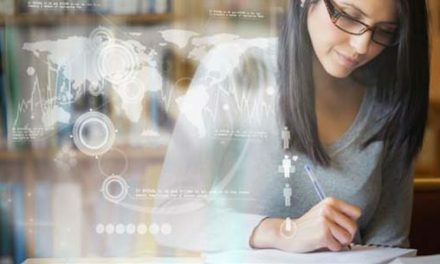 The initiative is led by the Forum for Agricultural Research in Africa (FARA), the West and Central African Council for Agricultural Research and Development (CORAF), the Food, Agriculture and Natural Resources Policy Analysis Network (FANRPAN), the Asia-Pacific Association of Agricultural Research Institutions (APAARI) and ICRISAT. 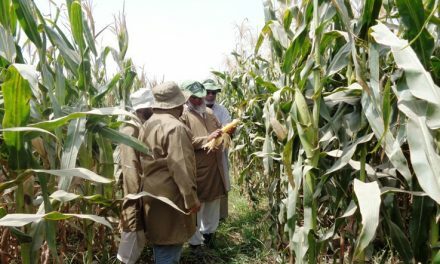 The Niger government’s inaugural national millet festival (FESTIMIL) is a trailblazer and has succeeded in raising awareness on the importance of millets, recognizing the challenges of its value chain, creating synergy among actors, and attracting investment to improve food and nutrition security as well as income-generation activities. “Since antiquity, millet is a staple food crop of our societies in the Sahel region in general and in Niger in particular. We need to work together with development partners like FAO and research organizations like ICRISAT and INRAN to support the production and productivity of millet,” said Mr. Albadé Abouba, Minister of State for Agriculture and Livestock. 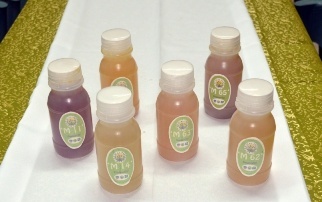 “FESTIMIL contributes to the Government of Niger’s strong commitment to the promotion of local products. Millet being energy-dense and nutritious food, is particularly recommended for children, the elderly and also for convalescents,” added Mr. Abouba. He called on technical and financial partners for more support and investment in the development of millet value chains in Niger. “Millet is adapted to poor and arid soils. It is a staple food produced by our hard-working farmers and consumed by more than 80% of our population. 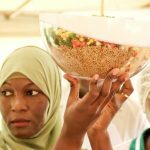 FESTIMIL is a chance for Nigeriens and the international community to know more about the extraordinary nutritional virtues of millet, especially for children, breastfeeding women and even the sick,” said the First Lady of Niger. First Lady of Niger (left) and the Minister of Agriculture and Livestock (right) visited the Smart Food stall. 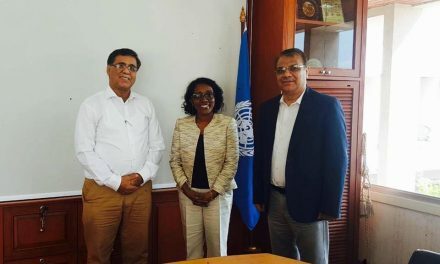 The duo interacted with Ms Agathe Diama, Head-Regional Information, WCA-ICRISAT, who is also Smart Food Coordinator. As a follow-up, the first Lady requested a Smart Food Master Class for all chefs at the Niger Presidency and other key public institutions. “Our commitment to this initiative is of great importance not only for our country, but also for all the Sahelian countries that have adopted millet for centuries and have made it their staple diet,” the First Lady, who is also the President of the Tattali Iyali Foundation, said. “Tattali Iyali Foundation will always be by your side in promoting, enhancing and popularizing millet-based products, our common heritage. Let’s consume millets,” she added. ICRISAT’s is the world’s leading center for research on millet, and has large research facilities in Niger for crop improvement and value chain research. Dr Carberry commended the outstanding partnership between Niger and ICRISAT while thanking the government and the First Lady for their support and engagement in promoting millet as a ‘Smart Food. Exhibition booths of different millet products (raw and processed) from across Niger were presented to visitors and participants. ICRISAT partnered with the ” Institut International des Métiers de l’Aviation du Tourisme & l’Hotellerie” to provide a Smart Food Master Class to 25 students of this school. A Smart Food tasting and competition was organized for all the festival participants. 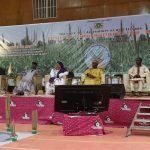 During the discussion on the first theme, Dr Alhassane Agali, a crop physiologist, underlined the possibility of producing irrigated millet to achieve the objectives of the strategy, ‘Nigeriens Nourish Nigeriens’. Subsequently, Dr Njido Kane, a geneticist and molecular biologist, explained adaptability of millet in the Sahel from a genetic viewpoint. Dr Ahmad Issaka, millet breeder at the Niger Agricultural Research Institute (INRAN), said inter-annual variability calls for the development of highly heterozygous millet cultivars with good plasticity, a prerequisite for good yield stability. He stressed, however, the fund constraints in participatory research, which slows production of new varieties. The discussions on the second theme saw Mr Kaka Saley, Head of the Food Technology Laboratory (LTA) at INRAN, focus on the ways of processing cereals such as millet for a better diet. He emphasized the importance of operations and treatments during processing of millet. Mr Saley is also the President of the Technical Harmonization Committee 2 (CTH2) in charge of the harmonization of food standards of ECOWAS (since 2015), and of the National Technical Committee for the elaboration of agro-food products standards in Niger (Since 2003). He further said that several methods of treatment have been developed and popularized by the Food Technology Laboratory of INRAN to ensure that essential nutrients such as zinc, iron, calcium and proteins in millet are not blocked. He also pointed out that less than 1% of production is processed in Niger and suggested a value chain ​​approach to boost the quality of processed products. Dr Mahamadou Aboubacar, Head of Nutrition Unit, Head of Capitalization and Knowledge Management Division at the Office of the High Commissioner for the 3N Initiative (HC3N), outlined the nutritional situation of vulnerable groups, mainly women and children, in Niger and recalled the major actions planned as part the multi-sectoral nutrition security policy implementation. According to Dr Aboubacar, the situation of undernutrition in Niger is being driven by iron and zinc deficiencies, resulting in anemia among women and children. There is also an emerging problem of obesity. At the village level, the decortication of millet for preparation of dishes with long cooking times affects micronutrients in food. Calling for collaborations between research institutes and the small industry, he suggested the development of complete and fortified flour to meet the needs of the population. Dr Fatoumata Hama, a nutrition researcher specializing in the nutrition of vulnerable populations and responsible for the Sensory Analysis Laboratory in the Food Technology Department (DTA) of the Institute for Research in Applied Sciences and Technologies (IRSAT), National Center for Scientific and Technical Research (CNRST), Burkina Faso, highlighted nutritional qualities of millet, including its ability to supply the body with lysine better than other grains. She insisted that millet is a means of fighting poverty because it has an added value. She shared Burkina Faso’s experience in setting up incubation centers in rural areas to process local cereals and how this has contributed to improve household baskets and family incomes. Dr Moumouni AbdoulAziz, endocrino-diabetologist and nutritionist at the National Hospital of Niamey, Niger, attributed diabetes to food imbalance and encouraged consumption of millet for dietary diversification. Discussions on the third theme focused on challenges and prospects in millet value chains. According to Mr Issa Mano, an agricultural engineer from Ahmadu Bello University in Zaria, Nigeria, the biggest challenge facing the industry is related to performance, which remains well below the world average. Mr Maïzama Issoufou, Agronomist, Secretary General of the Association of Private Seed Producers of Niger (APPSN) and Managing Director of Alhéri SA Seed Company, called for reinforcing the input supply mechanisms in Niger. Ms Liman Aminatou Issaka, President of the Federation of Women Processors of Niger, said she is currently working with research institutions to integrate a range of fortified organic millet varieties rich in iron and zinc to combat malnutrition in children, pregnant and lactating women. Also, she sought integration of processed millet products during the constitution of food security stocks by the state. Mr Djibo Bagna, president of a peasant platform for hundreds of groups and unions of agricultural producers in Niger, asked for greater support to agricultural extension systems in the country.